One of the best things about our full-time traveling lifestyle is meeting unusual people on the road that we never would have met in our former, conventional lives. The full-time RVing community is primarily American and Canadian retirees who are fulfilling a long held dream of seeing North America at leisure. We’ve met very few full-timers under the age of fifty, and although we’ve read about and heard about families RVing full-time, the first time we met a family living on the road in an RV was this past summer in Idaho when we were visiting Craters of the Moon National Monument. While scrambling over the otherworldly and exotic rock formations that make up Craters of the Moon, we spotted an unusual RV driving through the park. We weren’t entirely sure it was an RV, because it looked like an armored truck! A few hours later, in the town of Arco, we found ourselves parked near this very unique vehicle. We just had to go over to meet the owners and learn more! They were a French family on a five year tour of the world by RV. Mom and dad — Silvie and Jean-Herve — had purchased their Unicat RV in France, and they had shipped it to Nova Scotia where they jumped aboard with their 3 year old son, Luka, to begin their circumnavigation by touring Canada and the US. When we met them in Idaho in August, they had been traveling for 18 months. Jean-Herve said their rough plan was to get down to Mexico for the winter of 2014-15 and spend about 5 months there before traveling southeast through Central America. Once they got to Panama, they planned to put the rig on a ship to cross from Panama to Columbia, and then begin two years or so of traveling around South America. After that they would board a ship once again to cross the Pacific from Chile to Russia, and from there they would travel through Central Asia to Europe, taking a year or two to get back to France. I was blown away! What a fabulous adventure. Jean-Herve is 49 and Silvie is 45, and they are no strangers to exotic travel in foreign lands. 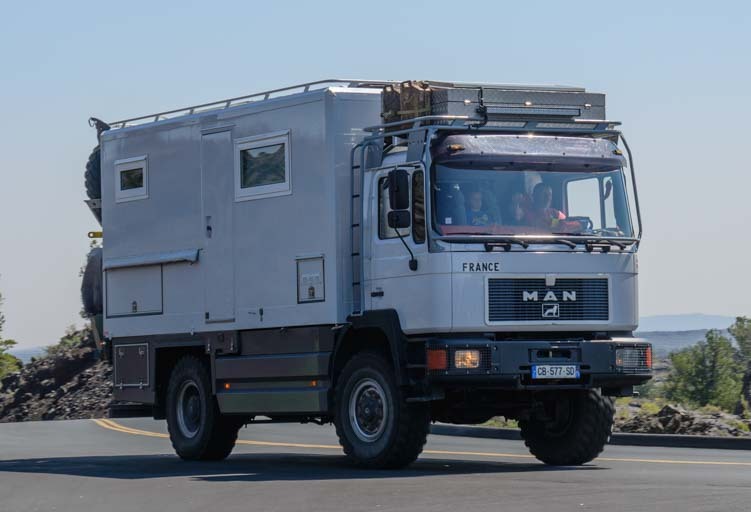 Their rig is rugged enough to handle whatever bad roads they might encounter, and they speak not only French but English and some Spanish, which will help them immensely in many of the countries they will be visiting. They keep a blog — in French, of course! If you don’t read French, you can enjoy their wonderful photos and run their blog posts through Google Translate to get a rough translation into English. These French voyagers weren’t the only World Cruising RVers we met in our travels this past summer. 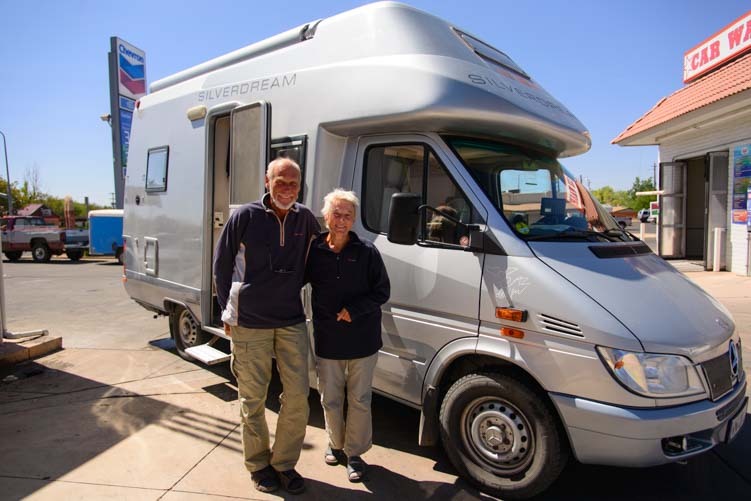 In Kanab, Utah, while dumping our tanks at an RV dump station, we met Heinz & Ursula, a German couple who had spent the last 18 months traveling throughout the US in their Mercedes-Benz Silverdream van. When I idly asked where they had gone RVing before they shipped their van to America, they ran down a list of continents and countries that made my jaw drop. Their little van had taken them on road trips to South America, Europe, North Africa, Mongolia, China and the Middle East. Wow!! While they did most of their RV travels solo, some of these road trips were done on guided RV caravan tours with European tour companies that arranged for German speaking local tour guides (however Ursula said the tour guide in Iran spoke only English, which was a challenge for a few of the folks on the tour!). The tour to China lasted six months and required each rig on the tour to get a special Chinese license plate. There were 18 other rigs on that tour, hailing from Germany, Austria & Switzerland. Trying to imagine RVing in China, I asked her what it was like. “Fantastic,” she said, “But too many RVs!” No matter…what an incredible expedition! International RV caravan adventure tours are hardly new. Over the years, Americans have ventured overseas with their rigs too. Back in 1951, Wally Byam, the founder of Airstream, took 50 Airstream owners on a tour of Central America. This adventure was followed by Airstream caravan tours to Mexico in 1952, to Europe in 1956 and a truly wild 9,000 mile south-to-north trek along the length of Africa from Cape Town to Cairo in 1959. In 1963 the newly formed Wally Byam Caravan Club went all the way around the world, and in 1985 eleven rig from the club went on a tour of China. How awesome is all of that? Happy Travels!! World Cruising Done Right (no need to buy a boat) !! Wish you could visit our home country and discover the beautiful places in the Land Down Under. Its great to hear that you’ve had a chance to visit Aussie.